If you talk to many Australians, they will sometimes say that the best inventions come from overseas. That’s because some Australians don’t have a high opinion of our ability to invent things. Instead, we look to other places such as Europe, Japan, Korea and the USA as being better than us at inventing things. For example, the USA has a reputation for computers and high technology. Europe builds wonderful cars. Japan and Korea are the inventors of state-of-the-art electronic devices. But really, every country has it’s fair share of smart people who can invent new things. Australia is no exception. In this podcast, I would like to tell you a little about just a few of the inventions that have came from Australia. The first is the Black Box Flight Recorder, also called the Cockpit Voice Recorder. This is the special metal box on an airplane which records all the information from the airplane cockpit, including the conversations of the pilot and crew. This was invented by an Australian scientist named David Warren in 1961. He worked for the Defence Science and Technology Organisation, which is part of the Department of Defence in the Australian government. He was involved in trying to find out what had caused the crash of a Comet Jet Airliner in 1953. He thought at the time that it would be useful to know what the airplane pilot and crew had been saying in the cockpit in the moments before the crash. 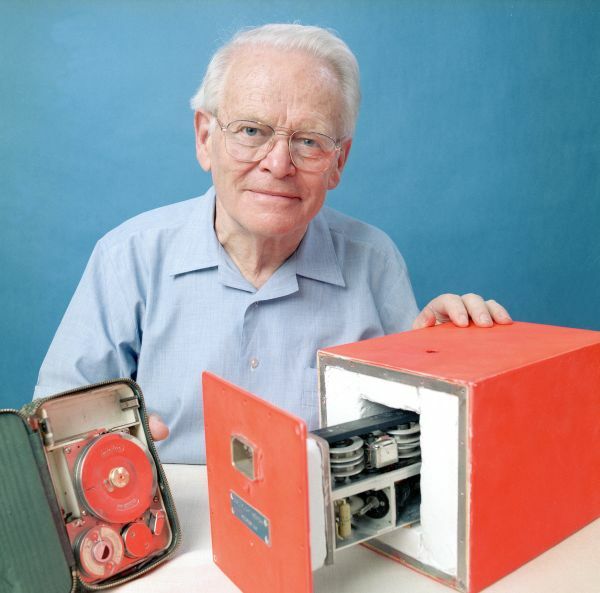 He decided to make a recording device especially for airplanes, based on a new compact recorder which became available in the late 1950s. His invention turned out to be a great success, although it took many years before the authorities agreed to use the device and develop it to the point where it could be used on all airplanes. David Warren had a distinguished career as a scientist in Australia and received many awards for his achievements. In 2014, the Defence Science and Technology Organisation renamed their headquarters building in Canberra the David Warren Building. He died at the age of 85 in 2010. Another Australian invention is in the area of medical science. The Bionic Ear is a very small electronic device that can allow a deaf person to hear again. It is implanted into the patient’s head to stimulate the auditory nerve used for hearing. It was invented by Professor Graeme Clark, who had conducted a lot of research in this area in the 1970’s. Even though his fellow scientists said it would be impossible, Professor Clark was eventually able to build a small electronic device which was successfully implanted into a deaf patient in 1978 at the Royal Victorian Eye and Ear Hospital in Melbourne. Professor Clarke has continued to develop his bionic ear and it is now estimated that over 250,000 deaf people around the world have bionic ear implants which allow them to hear. In 1983 he founded the Bionic Ear Institute in Melbourne, which continues to do important research in this field, helping to improve the bionic ear and bring its benefits to even more people. Professor Clarke is now 80 years old and has won many awards for his work, including Senior Australian of the Year in 2001 and The Prime Minister’s Prize for Science in 2004. Professor Clark is one of Australia’s most celebrated scientists. Australians have also played a role in bringing new technology to computers. John O’Sullivan is an electrical engineer who, along with his team, developed high speed WIFI which we all use every day with our computers and smart phones. John and his team worked for the CSIRO, which stands for the Commonwealth Science and Industrial Research Organisation. This organization is owned by the Australian government and does research in areas that will assist Australian industry. John O’Sullivan’s area of study was in radio telescopes for looking into space, but together with his team, they were able to invent a way for WIFI networks to be fast and reliable. Now we can all send and receive large amounts of information wirelessly between our computers and smart phones, thanks to John O’Sullivan’s important invention. John has received many awards for his work, including receiving the Prime Minister’s Prize for Science in 2009 and also the European Inventor Award for 2012. John is still working at the CSIRO and helping to build bigger and more powerful radio telescopes which can look deep into space. One of my favourite sports is motor racing (see Podcast 57). A great Australian invention in this sport is the Racecam. The Racecam is a television camera which sits inside the race car and gives a view of the race in real time, live. It shows the viewers exactly what it is like to be a race car driver. Nowadays, all major motor races around the world make use of this technology to bring motorsport fans the best and most exciting view of what is happening in the race. It was invented by Geoff Healy who was an engineer working for Channel 7, a television station in Australia. It was first used in the Bathurst 1000 car race in 1979. Geoff got the idea from his young son. One day, when taking his son to school in the car, his son picked up the family’s video recorder and suggested they make a video from the car of them going to school. Later, Geoff looked at the tape and thought, wow, that looks quite fast, because of the wide angle lens. He thought he could use this idea in a race car. Of course, they had many challenges to overcome, like how to send the signal back to the TV station and how to control the camera as the car raced around the track. They overcame these challenges and it was a great success. Nowadays, it is used in all forms of motorsport, including motorcycling. What a great invention. Good one Geoff! Of course, there are many other Australian inventions too which I haven’t mentioned here. Our Prime Minister Malcolm Turnbull wants Australians to be more innovative, so I think we will see many more inventions in the future, and that is a good thing. Podcast 67 Quiz - Did you understand the podcast? True or False? – Rob thinks that Australia has its fair share of inventors. True or False? – The Black Box Flight Recorder records all the information from the cockpit, including the conversations. True or False? – David Warren first used his Cockpit Voice Recorder in a Comet Jet Airliner. True or False? – At first, Professor Clarke thought that it would be impossible to build a bionic ear. True or False? – The bionic ear is now used by over 250,000 Australians. True or False? – John O’Sullivan and his team invented the radio telescope. True of False? – John O’Sullivan and his team have made WIFI fast and reliable. True of False? – Geoff Healy first thought of the Racecam when he was in a car race. True or False? – Geoff Healy and his team had to overcome some difficulties before they could make the Racecam work. True or False? – The Prime Minister of Australia, Malcolm Turnbull, wants to be an inventor. crew = the people on board the airplane who help the pilot. For example, the co-pilot. devices = smaller man-made machines. For example, telephone. WIFI = when you can send information between two devices through the air (wireless). A great post Rob that recognizes the contribution Australians have made to the world through their inventiveness. There are so many to choose from. My favorite is the discovery of Penicillin by Howard Florey. Thanks for sharing! Many thanks for your comment Ray. Some great discoveries by Australians, that’s for sure. Pencillin’s discovery is right up there.